Add a colour pop to your room with the Festival throw, which features all-over tufted dots and large pom poms on the corners. The decorative bed cover provides a breathable extra layer that brightens up your bedroom. First grown by Katie Graham and now flourishing in Australian homes everywhere, The Family Love Tree draws on the energy and ingenuity that rushes around this eclectic and creative city, but with a peaceful and seductive tone that comes from our love for all things lush, loose and harmonious. Created here and hand crafted globally, we are committed to never mass producing and always protecting the lives and environments of the beautiful communities who help create our products. We clash colours with textures and regularly break the decorating rules. After all, love is rarely simple. It is passionate and sensual yet diverse and lively. And that’s the kind of love we like to spread. 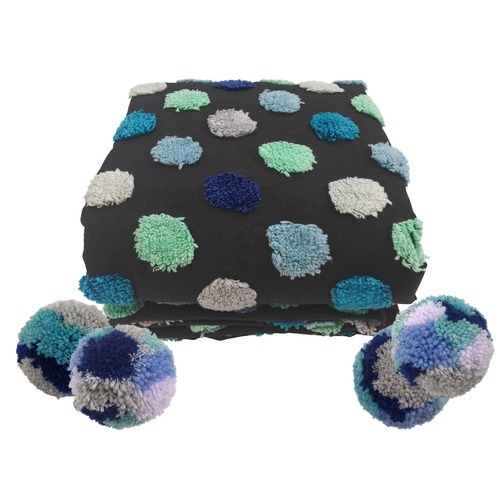 When you buy a Ocean Pom Pom Cotton Festival Throw online from Temple & Webster in Australia, we make it as easy as possible for you to find out when your product will be delivered to your home in Melbourne, Sydney or any major city. You can check on a delivery estimate for the TheFamilyLoveTree Part #: 63SPOTKINGOCEAN / 63SPOTDBLEOCEAN here. If you have any questions about your purchase or any other Blankets & Throws product for sale our customer service representatives are available to help.Whether you just want to buy a Ocean Pom Pom Cotton Festival Throw or shop for your entire home, Temple & Webster has a zillion things home.